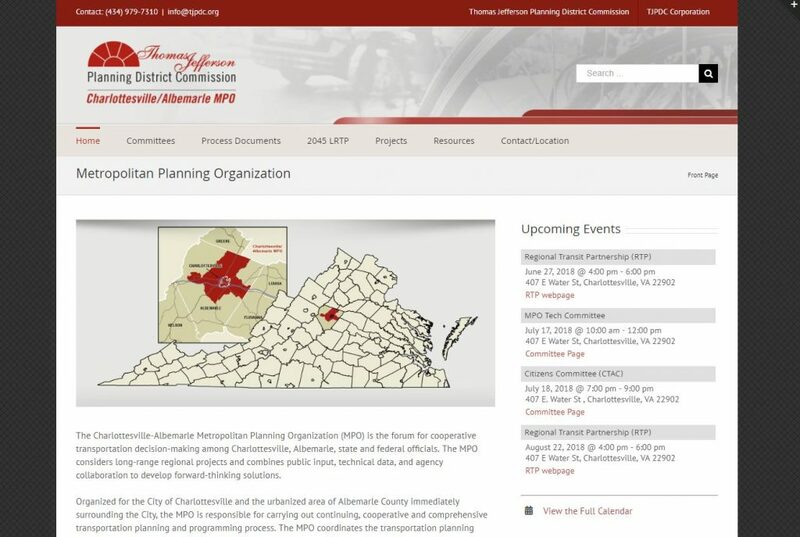 Prior to founding my company, I spent 10 years as Communications Director for the Thomas Jefferson Planning District Commission, a regional planning organization located in Charlottesville, Virginia. Formally created in 1968 by the General Assembly of Virginia, planning districts were mandated in response to a growing recognition that growth and infrastructure problems often transcend local boundaries. PDCs were intended to encourage and facilitate local government cooperation in addressing problems and opportunities on a regional scale. As Communications Director, I was responsible for management of the ongoing outreach initiatives associated with the planning process. While not quite the early years of the internet, much was changing with website design and functionality during this time. It became clear that a quality website could alleviate many of the difficulties of distribution of information. Putting in place the most requested content, along with an organizational system that allowed site visitors to easily find what they were looking for ended up being a key component of successful public outreach. 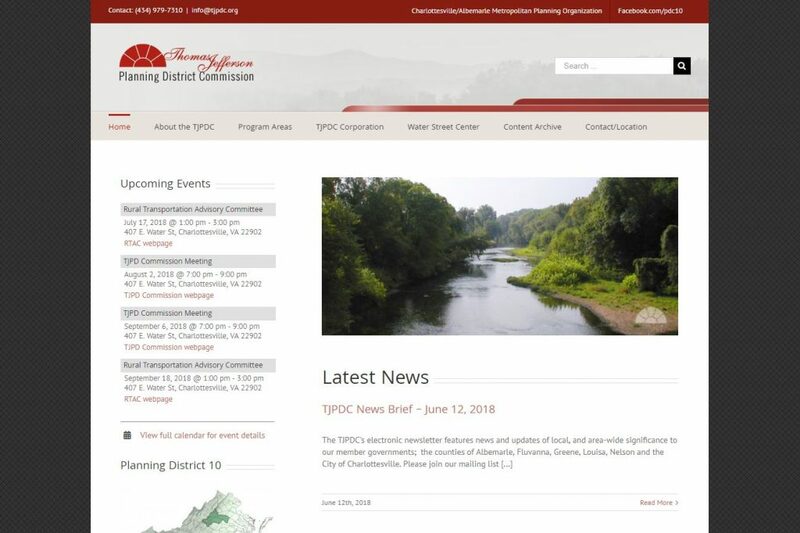 A decade and half later, I continue to manage websites for the Thomas Jefferson Planning District Commission and Charlottesville/Albemarle Metropolitan Planning Organization. It’s the experiences and lessons learned during this time that I bring to the table in solving communication problems for my clients. Information is key Remember that a municipal website is a space for citizens to get information: More citizens now expect that government websites will provide what they need, quickly and when they need it. Citizen feedback ensures that you are providing information that is relevant to your audience, and as a result, more people will trust the site and turn to it for valuable information. Websites work best when they are actively managed. Just as important as having the right information, your content should be current! If your website doesn’t provide information that is up-to-date, it can’t reach it’s full potential as a resource for viewers. Your website should be your hardest working employee. Let it do so by providing the information your viewers are looking for. Plan for maintenance from the start: Make sure you have a plan in place for site maintenance once the new site is up. This plan can be as simple as listing the functions that need to be carried out on the website, assigning a person to that task, and agreeing upon the frequency of the task. Assigning that specific role to somebody in the office or an outside support member will ensure your website maintains its value. Start simple and work forward from there: It is all too easy, when creating a new site, to want to add as many features as possible right away. Allow time to make sure site administrators are comfortable with the basics: updating and adding content, and then, as comfort-levels increase, you can begin to have conversations about adding extra functionalities in an incremental manner. Easily accessible meeting materials are essential: Meeting agendas and minutes are often some of the most viewed materials on a public website. These materials have huge potential to engage the public. Having current materials in place demonstrates that an organization is committed to citizen engagement and transparency. So, even if everything else on the site stays static, be sure to have your meeting materials updated in a timely manner. At RPCM we have the experience and understanding of what is required of local governments, municipalities, and regional organizations. Let us put in place a product that maximizes the effectiveness of your outreach initiatives. We offer full service website development, maintenance and webmaster services.